Rounding your shoulders and slumping doesn’t just make you look like you are slowly falling asleep, it is affecting your body in many different ways. 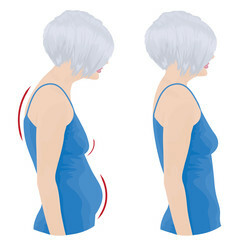 Over time, poor posture takes a serious toll on your whole body, not just your back. In fact, it can cause a cascade of structural flaws that lead to back, hip, neck and joint pain, reduced flexibility, and weakened muscles, all of which limit your ability to burn fat, build strength, and even your ability to perform your day to day activities. You can head off many of these problems by taking a simple self postural assessment, then using the exercises below to fix your form, reduce your pain, and get your curves moving in the right direction. And if these home remedies don’t work, physical therapy is a great option to get a formal assessment and treatment plan to address any issues you may have. Wear something form-fitting and take two full-body photos—one from the front, one from the side. Relax your muscles and stand as tall as you can, feet hip-width apart. Then refer to the fix-it plan to diagnose your posture problems. 1. Look at your ear. Take a ruler and draw a line straight down from your ear, straight to the floor. 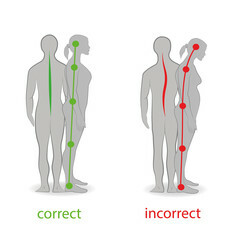 If it’s in front of the midpoint of your shoulder, your head is too far forward. 2. Can you see your shoulder blade? That means your shoulders are rounded and your shoulders may be winged. 3. If your hips tilt forward and your lower spine is arched significantly, this means you have an anterior pelvic tilt, which can be caused by weak abdominals as well as weak glutes and hamstrings and tight hip flexors. 4. Look at your shoulders. They should appear even; one shouldn’t appear higher than the other. The fix: Moving only your head, pull your chin in toward your sternum to make a double chin. You should feel a slight stretch along the back of your neck. Repeat for at least 20 repetitions. Cause: Weakness in the middle and lower parts of your trapezius, tightness in your pectoral muscles . The fix: Lie facedown on the floor, with each arm at a 90-degree angle in the high-five position. Without changing your elbow angle, raise both arms by pulling your shoulders back and squeezing your shoulder blades together. Do two or three sets of 10 daily. The fix: Kneel on your left knee, with your right foot on the floor in front of you, knee bent. Press forward until you feel the stretch in your left hip. Tighten your glute muscles on your left side until you feel the front of your left hip stretching comfortably. For a deeper stretch, reach upward with your left arm and stretch to the right side. Do three counts of 30 seconds on each side. Cause: Weak lower trapezius muscle, tight upper trapezius muscle. The fix: Sit upright in a chair with your hands next to your hips, palms down on the seat, arms straight. Without moving your arms, push down on the chair until your hips lift up off the seat and your torso rises. Hold for five seconds and do two or three sets of 10 repetitions daily.